Dave Wright scored twice as Littletown came from behind to beat Hartshead 3-2 in a thrilling Wheatley Cup semi-final at Clayborn last Thursday. They will now meet Gildersome Spurs in the final at Ossett United on May 2. A minute’s silence was observed prior to kick off as a mark of respect to Heavy Woollen District life member and former Spen Valley League secretary Mavis Ward, who passed away aged 91 on March 12. It was a repeat of last season’s Wheatley Cup final, which Littletown edged on their way to lifting the trophy. Despite Littletown making a bright start, with Joe Jagger heading over an early effort, it was Hartshead who took the lead against the run of play. West Yorkshire League Division One side Hartshead doubled their lead as Littletown goalkeeper Cameron Feather palmed an initial shot against the post and was on hand to make another excellent save from the rebound only for the ball to rebound off the opposite post, hitting a defender and bobbling over the line. A Jagger shot was distance was comfortably saved by the Hartshead goalkeeper before Littletown shot over from another promising position, while Paddy Sykes also went close from another great chance but it remained 2-0 at half-time. Littletown fired an early second half warning shot as David Wright went close before Curtis McMahon pulled a goal back with a fantastic strike. An excellent Feather save prevented Hartshead from adding a third goal before neat Littletown play got them into a decent position and Wright was on hand to bag the equalising goal. Hartshead were reduced to 10 men when a player received a second yellow card for dissent and Littletown took full advantage to complete their terrific comeback with Wright netting his second. 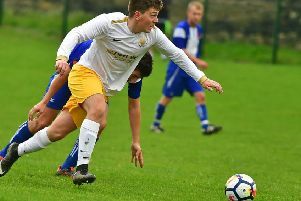 Feather had to be alert to make another late save to ensure Littletown progressed to the Wheatley Cup final, where they will meet Gildersome Spurs Old Boys on Thursday May 2 at Ossett United’s Ingfield (kick off 7.30pm). Gildersome Spurs previously booked their place in the final with a thrilling 5-4 victory over Woodkirk Valley. Littletown will return to Liversedge FC next Wednesday (April 24, ko 7.30pm) as they take on local rivals Lower Hopton in the West Riding County Amateur League Cup semi-final.